Just in case you were wondering whatever happened to that delayed-by-lawsuit 10-disc Marvel Cinematic Universe: Phase One - Avengers Assembled Blu-ray set that captured a full series of the Disney / Marvel movies, Amazon is notifying pre-orderers (previously mollified with free The Avengers discs) of the new release date: April 2nd. 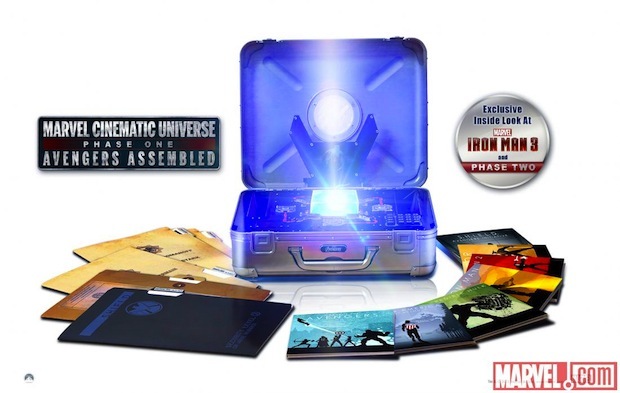 While the original suitcase has been scrapped due to a licensing dispute with its designer, a recent post on Marvel's blog revealed the set will still come in a not-exactly-S.H.I.E.L.D. briefcase complete with glowing Tesseract inside. The movies, bonus content, art cases and all are still intact, however with the delay have come a few extras. Buyers can expect an early preview of Iron Man 3 and the Phase Two series of flicks, as well as prop replicas and never-before-seen extras from the earlier films. The bad news? The price appears to have gone up, flashing a $219 MSRP and current selling for $197 on Amazon. While you're thinking that over, check after the break for a clip from Thor that didn't make the theatrical cut.